Fabric: Miss Kate pg 2 - Miss Kate by Bonnie & Camille for Moda. Miss Kate by Bonnie & Camille for Moda. First fabric shown is green and white. 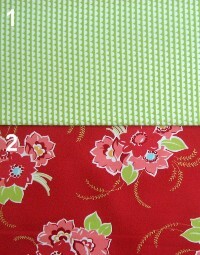 Second fabric shown is red with flowers.